Halladay no-hitter came in the first postseason start of his career. Roy Halladay of the Phillies pitched the second no-hitter in Major League Baseball postseason history on Wednesday as the Philadelphia Phillies beat the Cincinnati Reds 4-0 in their National League Division Series opener in Philadelphia. The only blemish on his night was a two-out walk on a 3-2 pitch to Jay Bruce in the Reds' half of the fifth inning. There were at least two hard hit balls against Halladay. Reds pitcher Travis Wood lined to right in the third. In the fourth inning, Reds star Joey Votto hit a hard grounder between second and third base that Phillies shortstop Jimmy Rollins fielded and threw to first for the out. On May 29, Halladay threw a perfect game against the Florida Marlins, the 20th perfect game in MLB history. On the night he struck out 11 batters. The only other no-hitter in playoffs history was a perfect game thrown by the Yankees Don Larsen, who won Game 5 of the 1956 World Series, defeating the Brooklyn Dodgers 2-0. Ramon Hernandez popped out to second to start the 9th inning. Pinch-hitter Miguel Cairo popped out to third baseman Wilson Valdez in foul territory. Brandon Phillips hit a slow roller about 10 feet in front of the plate that catcher Carlos Ruiz fielded and fired to first baseman Ryan Howard for the final out. "I felt like we got in a groove early [with catcher Carlos Ruiz]," Halladay said. "This is what you come here for. You come in you try to chip in and be a part of [the winning tradition]." It's surreal. It really is. To be able to go out and have a game like that. It's a dream come true. The baby got what he wanted. Trade me so i can play in the playoffs. I knew after the All Star break that the team would start to pull in on. Charlie Manuel is to be commended as again he has put together a great Pitching staff and the hitters to provide the offense. Philly, don't change nothing in the off-season and you guys will win again and start a DYNASTY. Bring on the Yankees! A perfect game and a no-hitter in one season-can you say Sportsman of the Year? Wow, talk about showing up big for a big game. 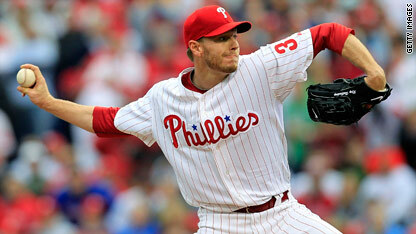 Congratulations, Mr Halladay, I don't like the Phillies, but you ROCK!! Ok, I am a true blue Yankee fan. But, I am first and foremost a baseball fan, and it was thrilling to watch Roy Halladay pitch his no hitter. He was simply great. So despite my love of pinstripes, I cheered the final out and applauded an amazing performance. You can never have too much baseball!!! LOVE the banter, congrats to Doc Halladay, just wish it could have been a grandslam from my man Holliday with the Cardinals 😦 ! NL all the way!!! YAHOOOOO THE PHIGHTIN PHILS are the BEST!!!!!! Congratulations to Doc, Chooch and all of the Phillies..great game!